Written on October 31, 2005 by Kevin. The Boppy is likely one of the best items we have purchased prior to Rylan being born. It is a definite every day used item and is must have when my wife is nursing or we are just holding Rylan. Holding an 8 pound bundle of baby can be very tiring on the arms after just a short bit of time. With the help of the Boppy however, feeding time and just together time is much easier. We purchased our Boppy on EBay for next to nothing and are very pleased with the purchase. The company states that it is washable however after we washed ours (bought used), it became a bit lumpy. Despite the few lumps, it is still very usable. Normal pillows just don't work very well for breast feeding however the Boppy really does a good job. 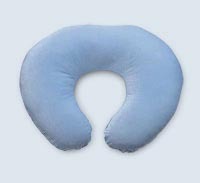 There are other similar products that extend the pillow to around your back, I believe in an attempt to keep it in place better. Sometimes the Boppy can slide out from around your waste resulting in the baby sliding down. This seems like more of a problem when Rylan is sleeping on his side or when nursing. Rylan seems to really enjoy his Boppy as well. He seems to pass out to sleep much easier while laying down on it. He also enjoys having the Boppy used to help prop him up so he can see out the window. Overall, my wife and I would highly recommend a Boppy for any new parents. With so many styles of pillowcases, these will likely fit into any theme you may have going. Circumcision + belly button stump, ouch. The day has come when little Rylan will become circumcised. I hope that subconsciously he doesn't associated Halloween with pain. Apparently, these days they do not perform the circumcision at the hospitals after birth as often as they used too. A 2 week delay is now the common time frame it seems. I know that the doctor will be using some form of local anesthesia however It makes me cringe to know that my son will purposely be cut. Not only cut but in a place that a knife should never be close too. However the benefits of my son being circumcised certainly outweigh any of the temporary pain that he may encounter. The big benefit of helping to prevent a certain cancer is certainly an important matter to look into. Rylan's umbilical cord stump still has not fallen off and it lays there dangling by a few bits. Every time we change his diaper it gets knocked a bit (unintentionally). Sometimes he cries, sometimes he does not. We are still uncertain whether or not it hurts him at all when it gets snagged. We noticed a bit of blood one evening after taking him out of the carrier. Seems as though that was the first night of many that it has gotten bumped, battered or grabbed. I was hoping that it would be off by the time the circumcision rolled around simply due to the fact of having to deal with 2 issues at once. Unless it happens to fall off on the way to the doctor, it looks like we are going to have to keep an eye on both of them carefully. Luckily though, the doctors appointment is today so she can take a look at his belly button and make sure everything is on track. Written on October 28, 2005 by Kevin. Pumpkin carving and trick or treating are great but, for my newborn son, that just wont fly this year. I have gone on a hunt trying to think of things that we can do with my son to celebrate the holiday. While there are very few ways to celebrate a holiday with a newborn, here are 5 ideas that I have come up with. Dress him up in a Halloween costume and take hundreds of pictures. Let him taste what pumpkin is like and again take hundreds of pictures. Show him a scary monster face and watch as his eyes get huge. Take a picture of your newborn next to a pumpkin. Do the same thing next year and see how much they have grown. Take more pictures of your newborn dressed up in costume. Written on October 28, 2005 by Rylan & Kaitlyn. What can I say, I'm a poopy baby. Lately I have needed a diaper change and right after I get changed, I immediately soil another one. I don't know what's going on but mom seems to change me about 5 times an hour. Mom and dad look real happy when I give them another surprise. Last weekend and just yesterday, I went to the chiropractor. Many babies come out with problems but I was almost perfect. Just a slight adjustment which helps with my digestive system. The doctor also adjusted my jaw which hopefully helps with feeding. It sure seems to help as I felt much better afterwards. Many babies with colic can be helped with some slight adjustments but many parents don't seem to know that. I'm glad that mine do. No one likes a fussy baby. In my last week in review I mentioned about peeing on my father, well I killed two birds with one stone and got both of them. Dad was sitting about 2 feet away in our rocker and mom was behind me. I sprayed dad all the way over there and mom got a blowout on the other end. This was shortly after the chiropractic adjustment which is said to make babies poop. It sure did this time. Dad threatened to pee on me if I pee'd on him again, lets see if that holds up. I can't wait for Halloween and showing everyone my costume. Pictures will certainly be posted here for everyone to see. Keep an eye out for them. Written on October 27, 2005 by Kevin. I was perusing the web yesterday when I came across a great forum for crafters. People of all ages seemed to be members and they had some great ideas and suggestions for DIY crafts. Call me what you want but I enjoy doing some crafts and now with a son, my wife and I can do them with him. I grew up with my mom making crafts and selling them so I am very well adjusted to them. 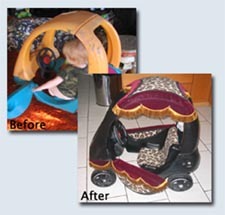 Anyways, one of the featured projects caught my eye as its nearly Halloween and this one women decided to pimp out her sons Little Tikes car. Its said that the car matches with his Halloween costume which I can only assume is a pimp outfit. The women makes a good point though and gives a warning about spray painting the plastic even with 'child safe' paint as it does seem to flake off easily. None the less, this kid likely has the best little car on the block, at least until her pulls it all apart. Check our her forum post and then check out the rest of the forum for other great ideas. With a newborn baby it is especially important that they are receiving an adequate amount of food. 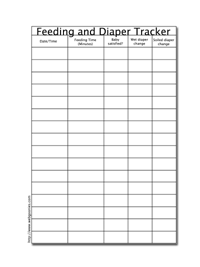 Regardless whether you are natural feeding or using formula, it is important to track the intake of food. How much a baby eats is in direct relation to how many diapers changes that are required each day. Generally speaking, the amount of diaper changes per day will depend on the amount of food that your baby takes in. Newborns that feed naturally will tend to eat more as the milk is easier to digest than formula is. Babies that are receiving plenty amount of food can expect 3+ soiled diapers and 7+ wet diapers per day. A wet diaper alone is however not a 100% sure way to determine whether or not your baby is getting enough liquids. Even dehydrated babies can pee throughout the day. Soiled diapers and weight measurement are the best way to determine your baby is on the right track. In an attempt to help my wife and I judge whether or not Rylan is receiving enough, I have created this small Food and Diaper Tracker. 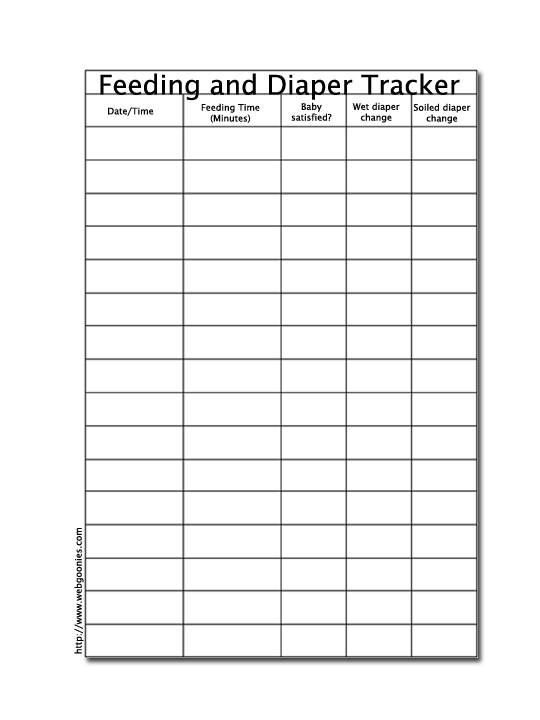 Simply click the image to the right, print out and use it to track your feedings and necessary diaper changes. Hopefully it can help determine whether or not a baby is receiving enough and let the parents worry about something else. (Darth Vader Voice) Rylan, I am your father. Written on October 26, 2005 by Kevin. Supreme Chancellor Palpatine morphed Anakin Skywalker into Darth Vader by the end of the 3rd Star Wars movie. I like to think that over the past 9 month and the next 18 years I will help my son become the man he was destined to be. A definite part of parenting is the ability to help guide your child towards success. Unlike Darth Vader though, my son will not be guided by the Dark Side, however for Halloween, anything goes. What better way to celebrate Halloween but to wear Darth Sidius and Darth Vader costumes. The similarity between Darth Sidius's role and real fatherhood would make these costumes truly perfect. 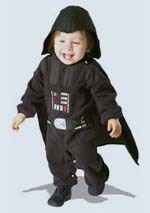 It turns out that Darth Vader is the second most popular baby costume in recent years. 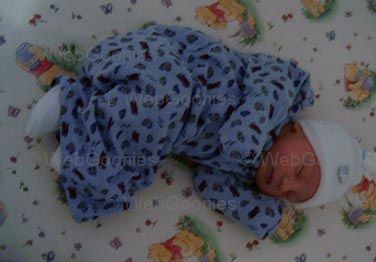 Here is a list of the top 10 baby costumes provided by AmericanBaby.com. Click here for a slideshow version of the list with pictures. Telepathy, the direct transference of thought from one person to another without using the usual sensory channels of communication, is the first thing that comes to mind when I sit at work and hear sounds from my son. Sounds that may include screaming or his gurgles. Would this be telepathy or simply a strong fatherly bond? Either way, its something that I had no clue that I would obtain once Rylan arrived however it makes me feel a strong connection to him. Even when busy at work I hear these noises and it makes me wonder whether or not he is in fact crying at the time. My wife and I may attempt to find out one of these days by documenting the cries and see if they match up on their times. Certainly would be impressive if they in fact did match up. The thought of having a gifted child makes me even more proud of him than I already am. Written on October 25, 2005 by Kevin. The title says it all. My wife and I had a hell of a time last night trying to get some sleep. We went out to dinner for the first time with Rylan last night and he slept through the entire dinner. I figured we would have some problems with him sleeping during the night but nothing could have prepared us for what we went through. I sit at work now with a terribly painful back from bouncing Rylan for extended periods of time last night. The ultimate issue that seemed to cause this night of zombie'ism was the fact that Rylan is not feeding from my wife very well. The neighbors most likely know when Rylan is being fed because they can hear the screams from my wife. Feeding is supposed to be a slightly discomforting act but when my Rylan chomps down and causes blisters and bleeding, something isn't right. Its been a week now and the problems remain. We wonder if he is getting enough food but luckily his diaper count seems to confirm that he is. Books on breastfeeding have been purchased and referenced with no luck at all. My wife has pumped and given that to Rylan but when even that doesn't work, you know you are having a bad night. As much as we haven't wanted to use a bottle, we have been forced to lately. On top of that, we are even more against using formula but last night we were at a point where we fed him formula or he simply would not get fed. A point in time where my wife likely seems terrible and possible an inadequate mother. I hope that me reassuring her that she isn't worthless means something. My wife continues to want to feed him naturally but things don't look good. We have run out of ideas on how to correct Rylan's latching problem. My wife had talked with a lactation consultant prior to being discharged from the hospital and her advice was only a start. Unfortunately paying $70 for additional advice from another consultant is not possible. I can only hope that Rylan begins to feed correctly or mom suddenly has her pain threshold increased. Written on October 24, 2005 by Kevin. On Thursday, we took little Rylan to his first checkup outside of the hospital. Unfortunately we were not able to see his normal pediatrician however my wife sure seemed to enjoy the replacement. My wife can best describe this doctor as a mix between Bill Cosby and Barnie. Rylan didn't seem to mind him either and let the doctor do a full checkup without crying a peep. I can definitely agree that the doctor was nice however I did not feel as comfortable with him as I did with our normal pediatrician. He seemed to fumble his words more than even I could. Anyways, let me explain the title of this post. While finishing up the checkup, I was standing next to the doctor and my wife was sitting in a chair nearby. While the doctor was talking with us, out of nowhere, he farted. Now babies do fart and so do adults but I am 100% certain it was not me nor Rylan who did it. The only one left to be blamed was the doctor. He went on talking without even a pause. I applaud him for continuing to talk without disruption. It takes a true professional to do such a thing. How would you react to your child's doctor openly farting next to your and your child? Would you feel disgusted and find another doctor? On a side note, one thing that many parents look for in a pediatrician's office is whether or not they keep sick children away from healthy ones. While initially I was happy with the fact that they had 2 doors, one for each type of child, it became clear to me that the doors led to the same place. They had 2 rooms, connected by a short hallway where the office staff sat. It would be further unlikely that each room has a separate air conditioning system. A definite false security if you ask me. Written on October 21, 2005 by Rylan & Kaitlyn. Week in review is my section where I get to talk about a little about myself and the new things happening. Monday was an interesting day for me and my mom. Her water broke and we all went to the hospital where she was given pitocin. After a while the contractions got so bad that she had to get an epidural. My mom was very brave to go as long as she did without the epidural. After about 16 hours or so of labor, it was time to push and it took under 30 minutes of pushing to deliver me. After a bit of time under the warming table I was escorted to the nursery where I stayed for a bit over an hour. I had a fever which quickly went away. The rest of the stay I was next to mom and dads side. Every minute I impress my parents with my Hercules amount of strength. I don't know of any other newborns that can already lift their heads up and keep it there. All of the girls are going to love me. Let me tell you about my dad and the first time he tried to change my diaper. It was pretty pathetic. Luckily though he seems to be getting the hang of it. Someday though when he isn't prepared, I'm going to pee all over him. It's going to be hilarious. The rest of the week has mainly been adjusting to my new home and life. My kitty brother and sisters seem to like me and I can't wait till I'm older and I can rub their bellies. I will update everyone next week with a bit more information. Written on October 21, 2005 by Kevin. For all of you new parents or parents to be, read this. For the parents who have already raised their kids, read this and think back. Imagine how you may have increased your quality of life with this simply trick. A babies cry is one of natures loudest sounds. A quick Google search shows that a babies cry can register between 85 and 110 decibels. This is as loud as a subway train, a snow blower and even factory machinery. Damage to the ear can be caused with sounds over 85 decibels. It doesn't take long for a new parent to understand just how loud their baby is when it is placed next to their own head while burping or general soothing. There is no way to simply turn down the volume of your baby however there is one possible work around. Ear plugs. I have never heard anyone suggest ear plugs to help with a crying baby. Is it possible that parents who now have degraded hearing could possibly blame their crying baby? Now I am not saying that ear plugs should be used to completely block out the baby crying. Babies cry obviously for a reason and the parents need to figure out why and how to resolve the problem. 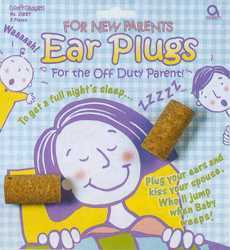 The ear plugs however would work great for when the baby just cant get soothed and your patience is running thin. A baby crying is likely the biggest reason why parents/supervisors may shake a baby. I can only imagine that a part of postpartum depression may also be caused by a crying baby. Ear plugs simply seem like a great way to help yourself in multiple ways. The image shown above represents a company who needs to rethink their packaging. While they may consider it a humor gift, ear plugs I believe can be a real help. However packaging them and saying that you can get a full nights sleep is irresponsible. Written on October 19, 2005 by Kevin. My wife, baby and I are all back home this evening. We are adjusting to life at home with the new baby. The cats are also having to go through adjustments of their own. They seem a bit worried with a newborn crying however our oldest cat, the one we thought may most annoyed, seems generally ok. She seems to get worried and curious about the crying baby and comes close to check him out. Overall, things are going nicely so far. Its nice just to be home and attempt to get everyone back into a rhythm. Lets see how much sleep we can get tonight. Written on October 18, 2005 by Kevin. Here is a first peek at Rylan....more photos to come when Dad returns home. Grandma here, posting for Kevin as he is still at the hospital....letting everyone know that baby Rylan was born this morning at 6:49 am. He weighed 8 lb. 7 oz and was 22 inches long. Dad, Mom and baby are all doing great! Baby Rylan is gorgeous...but you know, this IS a Grandma's point of view! I think Mom and Dad share it though! Speaking as Kevin's mother, this is going to be one terrific Dad as he surely earned his stripes over the last 24 hrs! As of 12 Midnight my wife is now 5-6 cm and progressing beautifully. More updates when I can get to a computer. Written on October 17, 2005 by Kevin. My wife and I are currently at the hospital and have been since around 11:30am. My wife has burned through the IV pain medication and is currently loving the epidural. We are currently sitting at about 4cm dilation and hopefully the rest will progress quicker. Pitocin is helping the process by strengthening the contractions. We are all doing well so far and I will attempt to keep everyone updated when available. What better way to celebrate Halloween than with a bit of imitation cannibalism? This is likely one of the oddest HOWTOs I have ever and will ever post on this website. 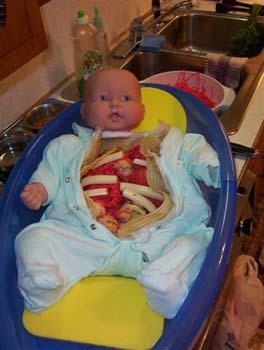 Simply speaking, this guy explains how to make what he calls dead baby pasta in which he uses a collage of food ingredients to create the carcase of a baby that you can serve right out of. This would certainly be an interesting dish to bring to a Halloween party. No one ever said was edible of course. Written on October 14, 2005 by Kevin. What better way to finish this week than surfing while at work. Here are a bunch of great posts from fellow daddy bloggers that you may have missed over the week. Patatamonkey.com made a very useful contraction counter which will help you time the pregnancy contractions. Of course this requires you to basically sit in front of the computer but that's besides the point. DaddyTypes.com began a new contest to design a baby tattoo. Try your luck and you may win a handful of the tattoos and a DaddyTypes tshirt. ModernDayDad.com shows us that carving a pumpkin can be done on a manly level as well. Just use your trusty dremel. ThingamaBaby.com explains his secrets to garage sailing. First rule is to start early. I can certainly agree to that one. Written on October 13, 2005 by Kevin. You would think that after the multiple Chucky movies, people would know not to bring a demented looking doll into their home. These dolls however make Chucky look like a Boy Scout. You have a choice between a handmade or store bought doll from Spencer's Gifts. No doubt, a perfect gift for your young child (company gives a disclaimer about small parts not suitable for children). Nothing says Happy Halloween more than the look on your kids face as they pee their pants in pure terror. I can almost feel the power of the Devil gripping my soul as I write this. On Tuesday my wife had the opportunity to have a fourth ultrasound which turned out to be a bit of a fun one I hear. Unfortunately I was not able to go with her but I definitely got to see the picture that she received. It turns out that my son is camera shy and will not show his face however he is all for showing 'other stuff'. We have a definite confirmation that we are having a baby boy. There is no doubt in our minds now. The reason for the ultrasound was to make sure the baby was safe due to my wife's belly showing bigger than it normally would be. After working their magic, they say the baby currently shows around 7lbs 11oz, however it is not uncommon for the ultrasound machine to be off by a complete pound. So we may already have a 8lb baby on our hands. With all of the pregnancy issues my wife has been having, we are were hoping that the labor and delivery would make up for it all, however that doesn't seem to be the case. 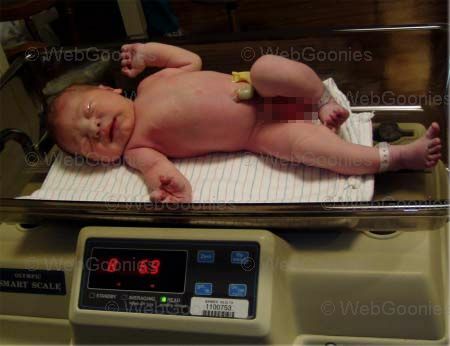 I cannot imagine delivering a 6lb baby, but an 8lb baby is gonna be hell I imagine. My wife has spoken to her doctor and it is not locked in but they are looking to possibly induce my wife on the 20th. One day short of the due date that they have given us. Lets hope that we don't even need to make it to the 20th and my wife can have the baby as planned. Product reviews at your fingertips. Written on October 11, 2005 by Kevin. While surfing some parenting forums, I found a quick review on the Mighty-Tite by Sunshine Kids. The concept of this product is to make sure your car seat is as tight as possible. My wife and I have tested our car seat in the car and the carrier base simply doesn't want to cooperate. The base has a movement of at least 4 inches on each side. That is simply not acceptable by our standards or the local inspectors. When I saw the review for this seat belt tightener I thought that it may be the answer I was looking for but I figured I would do a bit more research on it. The first thing that caught my eye is the numerous complaints from members on Amazon.com. One woman reports that her local fire department refused to install it as they said after-market items are not safe. Another woman was also told from a police officer that the item was not safe and in fact had broken while being installed. On the flip side however, maybe people have used the product for years without issues. My parents and their parents before them didn't have one benefit to raising a child. They did not have the ability to have product reviews at their fingertips. The ability to see peoples general opinions and possible issues with products prior to purchasing makes parenting easier on you and the checkbook. Websites like Thingamababy.com have near daily reviews on products that he has first hand experience with. Who ever said the Internet was worthless? Written on October 10, 2005 by Kevin. For over 100 years now, people have been taking pictures or videos of their family or other memories. Fast forward to 2005 and you would be hard pressed to find the equipment capable of playing any of these videos from over 40 years ago. Times change and so does technology. With the increase in digital cameras and camcorders in the home, people are now in full control on what they record and what they do with it after that. Looking ahead, the videos and pictures you take now will likely be seen by your children and probably their children as well. The problem with technology is that it simply gets out dated and eventually your parents long lost wedding video that was on an 8mm film is hard to get converted to a easy to use format. Hundreds of pictures are printed daily so family and friends can view them and allow others to see a moment in time from one persons eyes. The truth is that the majority of printed pictures will lose their quality. So the ultimate issue is that you have great film or photos that eventually wont be in a usable format or the printed image itself may not be visible. The question is, what do you do about it? Companies such as FujiFilm and many others are developing DVDs that they call archival quality and they boost a claim that the DVD will remain functional for over 100 years. Many of the cheaper DVD/CD producing companies cannot make this claim. Only time itself will tell whether or not these DVDs truly stand up. A second issue is that the technology today may not likely be accessible 50 years from now. To think that a DVD player would still be a primary source of media management would be crazy. Just like it would be difficult to track down a working 8mm projector now a days, new technology will come out to replace the old. The bottom line is that if you want to archive your family and the memories you share, you need to plan ahead. Burn photos and digital videos on archival quality DVDs. For other formats(DVDs included), always include the device necessary to play the necessary format. What good will a wedding movie do if no one can find the equipment necessary to view it? Written on October 7, 2005 by Kevin. Yet another posts about duct tape. Many of the child proof devices used to keep kids out of things they should not be fiddling with are plain ol' ugly. Ask 10 parents if they like the look of power outlet plugs and they will likely tell you they are hideous. Lifehacker once again thinks outside the box and suggest using the new breed of duct tape. Transparent duct tape that is. Simply cover the outlets with the transparent tape and hide those plastic plugs away. This new duct tape is said to last 6x longer than conventional grey duct tape and possibilities of this is endless. I wonder what other uses this clear duct tape could be used for around the house. Only in a land of make believe does a pregnancy go through without a hitch. While at my wife's recent checkup, the doctor again said the baby was bigger than he normally should. She has scheduled yet another ultrasound to get the baby looked at. While the ultrasounds are great that we can see our baby yet again, everytime they get a bit more worrisome it seems. So the history of the situation starts at 35 weeks when my wife was measuring at 37 weeks. When my wife went to her 37 week appointment, the doctor then measures the baby again at 37 weeks. So great, the baby just had a growth spurt and then has settled down. Now with the last appointment, the doctor says the baby is showing at around 39 weeks rather than 38 or so. So again the baby has grown. While its certainly normal for a baby to grow significantly the last month, this seems like its him playing a game of cat and mouse. Some people would likely love to have a big baby but my wife sure isn't looking forward to a 9lb+ baby. As the countdown says, only 14 more days till the babies due date. Lets hope it comes a bit earlier than that. Written on October 6, 2005 by Kevin. I am not one normally to pass on chain letters (except that one time when I was a kid I started my own) and the blog version of it doesn't fair better. In most cases I would consider them additional unnecessary information to weed through to get to the good stuff of a website. However when your blog finally does get tagged, it feels like a bit of accomplishment. Like someone enjoys my site enough(or not enough) to tag me. It seems most chain letters say you will die if you don't pass the letter on to X amount of people. AJ from Thingamababy.com however tagged me with the curse of writers block if I fail to recite the fifth sentence from my ninth posting. The joke is on AJ though because rarely do I actually know what to write about. I live in a land of writers block. But none the less, I will participate. 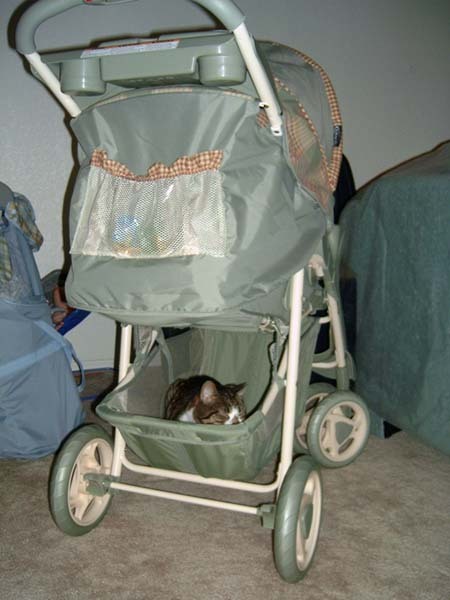 My 9th post was titled Cat tested, Father not-approved in which case I talked about how my oldest cat finding her way into the recently purchased baby bouncer. We figured the kitties would attempt this and tried to keep them out by putting a doll in it so they would stay off of it and to also get them used to having something in it. As much as I don't want to continue this trend, I will do so. I dont want a hundred fathers huffing down my back. I am not sure if the tag game has reached podcasts but I tag Who's Your Daddy Podcast. You will recite a bit about your 4th show or be dammed with a temporary loss of voice. Where in the fathering contract does it say that being a dad means you are forced to wear cartoon themed band aids? Show your son or daughter that you are a manly father. 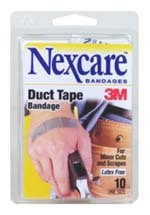 3M NexCare has designed what could certainly be called a manly band aid. Their latest product are the Duct Tape Bandages and are made to look and feel like real duct tape. Now when we get injured while doing some things around the house, we can continue on knowing that we don't look like a little kid. Unfortunately for some of you guys, it wont stop your sissy crying. Written on October 5, 2005 by Kevin. Bringing a baby into a home with 3 well established cats could certainly be a challenge. Many people don't seem to want to take the challenge and decide to get rid of their cats instead. This certainly is not an option for us. As mentioned in a couple previous posts [link] [link], our oldest cat seems to always find the most comfortable place to lay down for a nap. Unfortunately these are always baby items that she decides to lay in. I find it amusing that the cat can find so many great places to sleep, whether they are comfortable looking or not, she will use it. I cant help but think that maybe she is trying to get everything ready for the baby and making sure everything works before the baby has to use them. It may also be that she is trying to claim her space before the baby arrives. Both our oldest and youngest cats have had the opportunity to listen to the baby and feel his kicks. Our youngest cat will lay on my wife's belly from time to time like he is trying to bond with his soon to be brother. This type of thing never happened prior to the pregnancy. Only time will tell whether or not the cats will like the baby or just simply find him a nuisance. Written on October 4, 2005 by Kevin. My weekend began early after I had to leave home from work to take my wife to the hospital. The weekend went a bit more smoothly and we enjoyed the chance to go garage sale hunting and even went to the horse races. My wife enjoyed yet another night of swimming and generally, we had a nice weekend. Yesterday however, after returning from work, it appeared that the baby had not been moving as much as in the past so after a bit we decided it would be best to go to the hospital. After being hooked up to the monitor and the baby getting a buzzing, everything looked fine. I am not certain what the average amount of times a women goes to the hospital to get things looked at, but we have been there already 5 times. Maybe that just means we are protective parents, maybe paranoid, but either way, its better to be safe. My wife has not dilated any further than she was before. In the past when the doctor said the baby was about 2 weeks bigger than he should have been, we went to get the ultrasound to confirm that. It turns out now though that at her last doctors appointment, the baby was still at 37 weeks which means the time made up for the size difference. The baby is now at the right size at the right time. Her doctors appointment today should confirm that the baby is still at the right growth pace. Written on October 3, 2005 by Kevin. We had another great baby shower this past week. We started the night out with a great buffet dinner and then went back to the house for some o'so fun gift opening. A collection of great gifts including a baby bathtub, baby medical supplies and a great amount of baby clothing. I can definetly say that we are likely set for this baby to arrive. Everything seems in order and now we can only wait. Thank you for setting up a great baby shower. The baby tells us he can't wait to wear some of the clothing.